These Mini Ballot Boxes Are Small Enough for Suggestions at the Counter! These Suggestion Holders Have Clear Plastic Fronts for Advertisements! These Mini Ballot Boxes Are Ready to Ship! 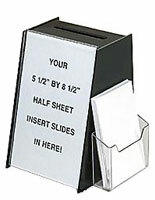 These mini ballot boxes are a wonderful choice for many establishments trying to obtain information. 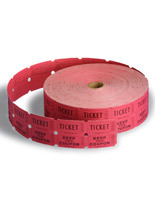 The suggestion holders work well for stores and organizations running a contest or vote. 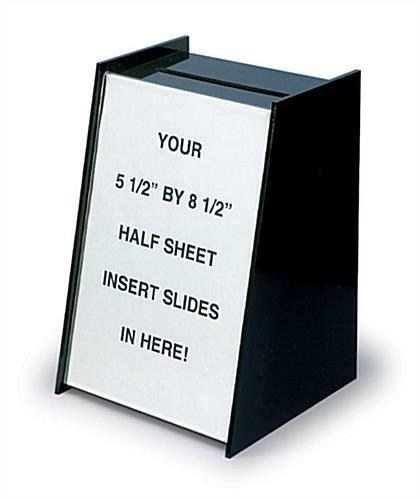 These mini ballot boxes, similar to acrylic registration containers, are 8-1/4" tall x 5-1/2" deep. 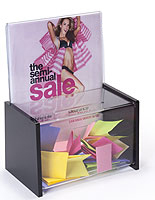 The suggestion holders are a smaller size to take up little counter space. 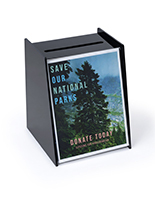 These mini ballot boxes feature a durable black acrylic exterior to last through many votes. The registration containers are not transparent, so users can keep the contents secret. These mini ballot boxes include a security pen for easy use. 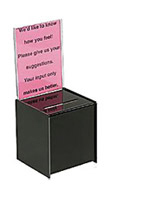 The suggestion boxes have everything necessary to run a successful opinion based survey. 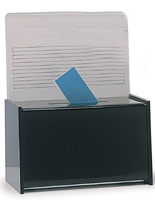 These mini ballot boxes include a clear plastic lens for graphics. 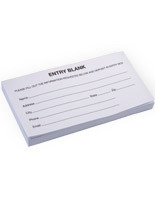 The registration containers have a graphic space of 8-1/2"h x 5-1/2"w to keep images prominent. 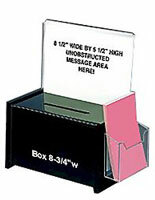 These mini ballot boxes allow users to make signs that provide context for what belongs in the unit. 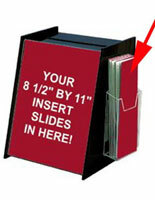 The suggestion holders have a slot size of 4-1/2" x 3/8" for receiving opinions. These mini ballot boxes offers a slide away cover that latches to the back of the container. The suggestion holders make it easy to unload the opinions without allowing customers access. 5.9" x 8.3" x 5.5"